Every year, Father’s Day seems to appear out of the blue & I always wonder how on earth we’re (more specifically the children !) are going to celebrate the day & thank Gavin for being a great Dad to them all. I love Midsummer’s Day (best day of the year, being rather a sun-seeker) & this year lots of friends are attending Waterloo re-enactments on 20 June – marking 200 years since 1815 – so close to the 800th anniversary of the signing of the Magna Carta too. I know Brussels will be heaving with Waterloo-ers. A friend there told me anyone would have thought Napoleon won, as there’s hardly a mention of Wellington ! 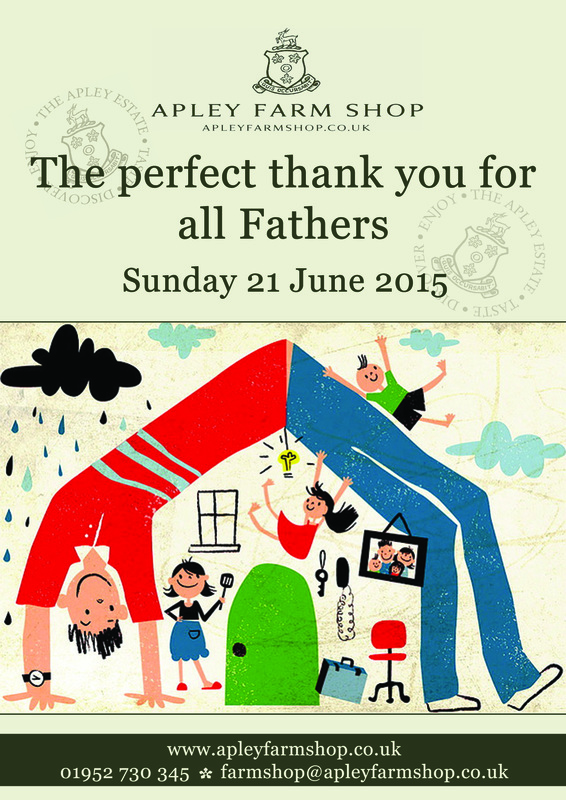 At Apley Farm Shop, especially for Fathers’ Day, The Creamery Café’s ever popular roast Sunday lunch will cost £29.99 for two courses for 2 adults & 2 children, with a free Apley Ale for Dad, made locally by Hobsons Brewery of Shropshire & a special Shropshire cheese board on offer (including Apley’s own Cheshire cheese of course !). If you’d rather spend Father’s Day at home, but need your meat, our Apley butcher will tailor-make a tray of barbecue meats especially for you. Select your favourites from the 8 different varieties of sausage on offer, add in some Apley lamb koftas, ‎Apley steaks or Apley beefburgers. It’s just for you – totally bespoke. Apley BBQ 4 U ! Finish off with English strawberries – we have a special offer (2 punnets & get your cream half price).